“We are excited for the launch of the Penthouse where our guests and their families will be provided with a truly memorable stay and enriching experiences," said Deborah Yager Fleming, CEO & Partner of Acqualina Resort. Acqualina Resort & Spa, the ultra-luxury resort celebrated for its style and award-winning service, announces the debut of its new Penthouse located high atop the 46th floor featuring panoramic views of the Atlantic Ocean and the Miami skyline. The 7,725 square-foot Penthouse blends one-of-a-kind finishes and exquisite art with a modern flair that accentuates the ocean. 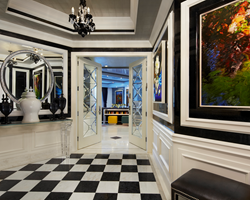 Upon booking, a personal butler will customize each stay from start to finish. Designed by St. James Design, the Penthouse features private foyer access, an opulent entrance with silver leaf ceiling and double glass doors leading to the open living area and an expansive oceanfront terrace furnished with a daybed, sofa and lounge chairs. The living room is spacious with incredible water views and adorned in neutrals, dark grays and splashes of color from exquisite accent pieces and has a working fireplace and 56-inch HD LCD TV framed in walls of white stone. There are five-bedroom options including a grand master suite with king-size bed, large bedroom with two double beds and den area with twin bed, a bedroom with queen bed, a media room with pull out queen sleeper sofa and a cabana guest house with king bed. Each bedroom option has its own private bathroom. A saltwater swimming pool and poolside cabana guest house create a truly personalized experience. The cabana guest house features both city and ocean views, wall colors in a blend of silver and taupe linen and a full bathroom with a unique porthole designed to add light. The serene outdoor environment includes a living wall, stylish cushioned lounge furniture, dining area with seating for 8, a TV and a summer kitchen. It’s the perfect spot for enjoying an alfresco afternoon cocktail or dinner under the stars. Additional features include a 10-person dining room accented by two crystal chandeliers that shine on a wood dining table set on a coral pony hair rug, an entertainment bar with agate countertop and backlit LED lighting, a custom designed kitchen with top-of-the-line appliances and separate breakfast area. A Crestron system conveniently operates with iPads and controls lighting, entertainment, sun screens, curtains and temperature. Rates for the Penthouse begin at $20,000. For more information or to make a booking, please contact Acqualina Resort at 305.918.8000.